​﻿Do you need some time to slow down and get away? Do you love travel, the ocean and new experiences? Then THIS is the voyage designed for YOU!!! Imagine waking up to a gentle Mediterranean breeze and the aromas of the crew cooking your first breakfast on board. ﻿It's time to head to the top deck as you begin with your first yoga class of the day in this private cove that seems that was made just for this moment. You are surrounded by water and beauty on all sides. You hear the wind hitting the sails as we allow the wind to be our guide to our next destination. Are you dreaming? Absolutely not, this is reality! 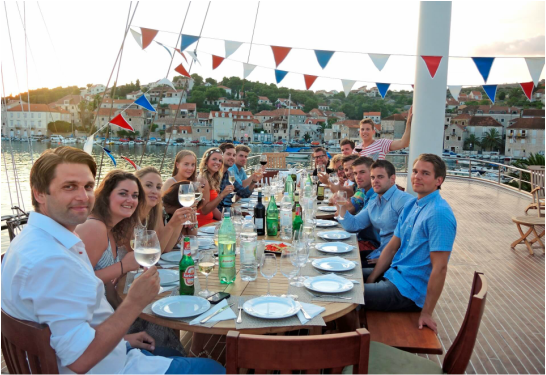 ﻿​﻿﻿You're actually sailing the Croatian islands in a private yacht with some of the coolest people you've ever met! Private - yes, just for our small group! Luxury - all the way! From the beds to the bathrooms to the sauna and jacuzzi on board, to the private Captain and crew cooking our meals in the beautiful galley and taking care of our every need! ﻿﻿Over the 7 magical nights and eight days you'll experience a sense of letting go that you never have before. The wind and our seasoned captain are in complete control, so you can really relax and let go. There is NO PLANNING NECESSARY. You'll be able to release and completely immerse in the beauty of these islands, of yourself, and the people around you. You'll be able to take the time to dedicate just to you - to journal, to experience, and let go! Take time away from the plans and demands of everyday life (details, work, responsibilities) so YOU can LET IT ALL GO, reconnect with YOURSELF, the ocean, and the islands. This week will be filled with yoga, journaling, exploration, sailing,and “Going with the Flow” as Life Coach and Yoga Teacher Sherry Smith will lead you through a journey of self-discovery. This trip is totally for me! Leaders and Doers - You're ambitious, have a very full life, have many demands and like to get things done, always doing too much - making it tough to slow down and stay in the moment. Planners and Type As - Always have to-do lists, like to be in control and have difficulty letting go. Givers - Who always give to those we love - work, careers, family, responsibilities. You deserve to be surrounded by luxury, the water, beauty, and like-minded friends in ultimate elegance! You’ve earned the right to reconnect fully with the most important person you know…YOU. You’ll benefit from taking time away and seeing your life from a new perspective - maybe making new decisions about going forward, or acknowledging that you're on the right path. ﻿﻿Does this sound like you? ﻿It's time to create the space that you have needed for so long for YOU to reconnect with yourself, with nature, and recharge! Yes! This retreat is totally for me! Sign me up! You’re blown away by Croatia’s charm and beauty with over 1,000 of the most beautiful islands in the world to sail through, each having it’s own unique character and charm! The untouched beauty is simply mesmerizing. It’s almost as if you’re in a dream! The water is so crisp and clear - you can see all the way to the bottom, with so many different shades of blue and green - it’s an artist's and photographer's cornucopia! You're enjoying a yoga class each morning and at surprise times and locations throughout our trip as our surroundings present themselves to you. As you anchor at each port, there are surprises and experiences that you never even imagined - through hiking, shopping, exploring, experiencing the local culture, food, amazing wine and mingling with the locals. Croatia sounds amazing, sign me up! The Venue - Prepare to be Blown Away sailing in our beautiful Gulet! ​You're boarding this amazing wooden vessel that seems like it is from yesteryear, but yet is equipped with modern luxury in every nook and cranny. 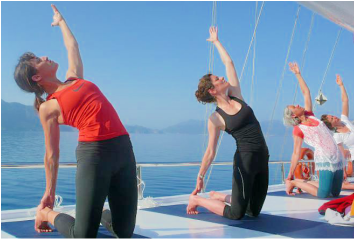 You arrive on board and meet your fellow yogis and you cannot believe that this entire boat is just for our group! 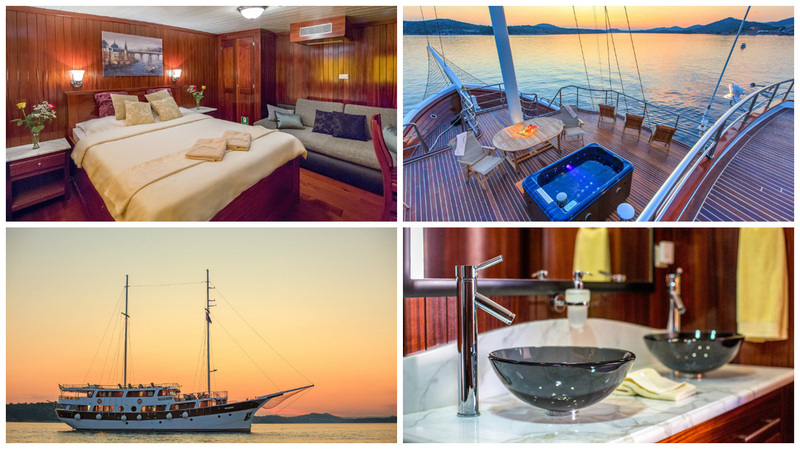 This magnificent Gulet, built in 2013 - (traditional Gulets were originally built and used by fishermen and sponge divers to transport their catch) has the historical build of the region, yet all modern comforts including impressive luxury cabins, private bathrooms including marble sinks and large rain showers, a beautiful galley, and even a sauna and jacuzzi on board! Our dedicated captain and 7-8 crew members are on board catering to our every need! You hear the sound of the sails while enjoying one of the most amazing lunches you have ever had - the traditional Mediterranean diet - fresh seafood, vegetables, some of the freshest olive oil and cheese along with the local Croatian wine! Croatia is known for its gastronomic delights - and is very similar to traditional Greek cuisine with its own twist - known for simplicity in preparation but exquisiteness in taste! The crew is busy preparing meals for us -breakfast daily and depending on our itinerary it could be lunch or dinner - made of the freshest and finest ingredients, local fish and vegetables. We're surprised daily with the creativity of the cook! The meals that are not on board are on your own where we are docked on purpose to give you a chance to sample the uniqueness of the local food, culture and people of each island on your own. (usually one meal/day, and because all the meals on the ship are plentiful, you can make it light). ﻿﻿﻿Daily meditation and yoga classes are structured around a theme with journaling, reflection and sharing time to give you space to be able to reflect on an intention that you have set for yourself for the week. We'll support you with that intention and give you tools to create goals or ways of being once you leave the retreat - to carry out your experience from the trip - to your daily life - to empower you to make new conscious choices to create a year of intention after the retreat. Classes are open to all levels - we normally have everyone from those that have never done yoga to teachers on the trip. We make it accessible for all - meeting you where you're at - yet giving giving you the challenge that you need. Many types of classes will be offered to support the activities of the day and the theme. You can expect a range from gentle/restorative/yin to more vigorous vinyasa flow and ashtanga/power style classes. Sailing, Great Food, & Yoga - Yes Please! All yummy excursions we have planned including a hike in the beautiful island of Hvar, and at least 2 other surprises! Daily yoga on the top deck overlooking the magnificent beauty allowing space for inner reflection, intention and goal setting. Classes are open to all levels - from novices to teachers - accessible for all - meeting you where you're at ranging from gentle/restorative to more vigorous vinyasa flow. ​* Participation in classes and activities is optional throughout the retreat. All levels welcome! Lots of interesting stops along the way. We'll stop at what we find interesting and that entices us in! The itinerary could change given the direction of the wind and our interest. We'll stop for impromptu swims in the ocean, pristine bays, snorkeling spots, just overall cool places that we want to check out! ﻿1. Reconnection to Yourself - Imagine leaving with greater sense of who you are and that you're ready and inspired to go back into the world with new found passion for your life. 2. Tools to keep you focused after the trip - We structure the entire week around a theme with journaling, reflection and sharing time to give you the space to be able to reflect on your intentions. We'll give you tools to create goals or ways of being once you leave the retreat in your daily life. You’ll reopturn home knowing what it feels like to really be connected. 3. Lasting friendships - You will be joined with others that have shared your experience that will bond you forever. You have new soul-”mates” call upon whenever you need to regain perspective, need advice or a listening ear. Ok, Ok, Let's do this! A special “Captain’s Dinner” where this will be an over the top dinner for us! Gratuities (It is highly recommended - just like a normal cruise - that you tip the cruise staff - as they're waiting on us all week). Recommended gratuities in cash are 150 Euros for the week from each participant to be split among the crew members. ﻿﻿﻿About 10 years ago, my husband had another illness and brush with Cancer where I was introduced to Moffitt Cancer Center. I was so impressed with the care that he received there, I decided to dedicate the next 10 years of my life contributing to this institution. I am still there and continue to coach people on how to provide the best possible patient experience in every interaction possible. Timing is right for me, I'm ready! Before you even arrive at your GO WITH THE FLOW Croatia Cruise, you’ll be invited to join a private Facebook group as soon as you register so you can get to know your shipmates, ask questions and share in the pre-trip excitement. What's even better is that when you get home after the retreat you can keep in touch with everyone, share pictures, swap stories, and keep everyone in the loop with your triumphs and challenges. You’ll also have a FREE 30 minute DISCOVER session with Sherry one month after the retreat, so together we can make sure you’re still on track with everything you learned. *The pricing is valid to Euro - USD up to 1.15 exchange rate. If the exchange rate is higher than 1.15, the final balance will be adjusted to reflect the higher exchange rate. ​The cruise will depart and arrive from/to the city of Split, Croatia (SPU).You can fly to Split from many European cities including London, Paris and, Rome and major hubs in Europe like Frankfurt and London where you could fly non-stop from the US and then make a connection directly to Split. Sherry is happy to help you navigate your airline travel options if needed. It is recommended to purchase tickets no more than 3-7 months from the actual travel dates as this is when airlines start pricing for fare sales. How long until the trip? Sign me Up! ​﻿Have never done yoga before? Never traveled abroad? We’ve got you covered! We have traveled abroad and to Croatia before and can give you the advice you need to arrive safely. Never done this for yourself? Just do it! There’s no time like now! It will be a life-defining week​. Traveling by yourself? Perfect! We'll partner you up with a roommate to share your room with. Once you sign up we also connect you with our private Facebook page so that you get to get to know the group before the trip - so you can find another friend to travel with if you’d rather travel with someone. What kind of clothes will I need for the trip? The weather is mild, so pack some shorts, light pants, sneakers, sandals, a few light sweaters for layers during evening or early morning hours, and a wind breaker for when you're sailing. What should I budget for meals? Most of your meals are covered and therefore, you definitely can eat light for meals on your own which will keep costs down. You can eat affordably and healthy if you know what to order. Try a few appetizers and salad for lunch or a light dinner. The cost of meals can be anywhere from 15 euro to 60 depending on the restaurant and how you order. We'll be happy to help you with meal decisions. I would like to immerse myself in yoga and self-exploration while I'm there. Is there time for that? YES! There will be plenty of time to reflect, do your own practice, journal, photography, sketching, whatever your creative outlet is. Are private yoga sessions and massage available? YES! Massages can be arranged once on board and Sherry is available for private sessions with yoga, meditation, and breath work. Do people speak and understand English? YES! Many Croatians speak English! Should I bring any yoga props with me (blocks, strap)? You should bring everything you need to practice yoga, especially your mat. Blocks will be provided, but please bring a strap and your mat. Additional Questions? Contact Sherry or go right to the chat option. We're happy to help! I have the info I need, sign me up!